Forget the big names and put away the guidebook, for a taste of some of the best eats Paris has to offer, be ready to head underground. With Michelin-starred restaurants and legendary food purveyors competing for the gourmand’s attention on seemingly every corner, Paris offers some of the world’s most famous and best-known opportunities for Foodies. But for those searching for something a little more under the radar, it should come as no surprise then that the nascent “underground restaurant” scene that has been cropping up everywhere from Sydney to Vienna is alive and well in the capital of gourmet, offering those who are in the know an unforgettable dining experience unlike any they’ve had before. Braden and Laura moved to Paris from Seattle after college, initially planning to stay for only a year — they have yet to return. Looking for an opportunity to share their love of food and to meet new friends, they decided to host weekly dinners in their home; dinners that eventually morphed into what is now Hidden Kitchen. Incidentally, their venture also provided an excuse for them to explore the abundance of food markets in Paris. When the celebrity food blogger Chocolate and Zucchini was invited over for a soft opening of the restaurant, the word was out, and Foodies from around the world were soon clamoring for a seat at this secret dinner club — myself included. The night finally arrived and my friend and I set out from our rented apartment, making our way onto the wet, cobblestone streets with plenty of time to spare, fearful of getting lost and never finding the building. Carefully following the detailed instructions, we were there a short ten minutes later, the first of the guests to arrive. While we waited — complimentary ginger mimosas in hand — I couldn’t help but peek my head into the apartment’s tiny kitchen to see where the magic was happening. 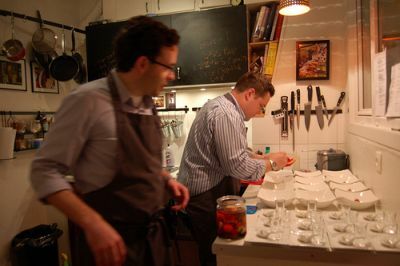 I recognized the feeling in the air immediately: my husband and I generate the same frantic energy when guests enter our own kitchen, particularly during those moments when we’re deep into dinner preparation and the pressure is at its zenith. Yet the energy I observed in their kitchen was a controlled energy — channeled into the multitude of details that go into making a spectacular dinner. Assisted by an intern from Le Cordon Bleu and under the watchful eye of their dog, Tatie, the young couple proceeded to serve a succession of elegantly presented plates to the group of twelve guests who had managed to squeeze into a dining room not much larger than a standard walk-in closet. The candlelit space grew increasingly boisterous as we progressed from the amusing “Zucchini Fritter on Crème Fraiche with Cucumber Dill Lemonade Shot” to the surprising “Strawberry Shortcake with Black Peppercorn Semi-Freddo.” (You read that correctly, a pepper dessert; surprisingly good.) I can’t help to think that the swelling enthusiasm of the room was perhaps heightened a bit by the generous allotment of wine that accompanied each dish. Unruffled, despite the feverish pace in the kitchen, Chef Braden found time to emerge from the kitchen to explain each dish before we dug in. Speaking in a quiet voice, we had to put our wine glasses down and strain our ears to hear what he was saying. Each interesting course pleased, peaking for me with the third: “Fava Beans Two Ways With Green Goddess Dressing and Arzak Egg.” The poached egg, so named for Spanish chef Juan Mari Arzak, was simmered in plastic wrap, lending it a flower shape. An avowed egg-hater, I felt compelled to try — far be it from me to commit a culinary transgression and refuse a plate. I was happily astonished to find it delicious, and have since added it to my own repertoire. Ideally, I would have preferred dining with a more diverse mix of people, but Laura explained to me that they alternate nights between visiting Anglophones and Parisians (to relieve the locals from having to field questions from distracting tourists.) Though I grumbled inwardly a little about having to dine with a table of other Americans, the group was at least interesting. Across the table from me was a blogger from America with her husband and to my left sat two backpackers. Next to the backpackers was a newly engaged couple; he had recently proposed to her, surprising her with this trip to Paris, complete with a helicopter ride to the airport. “I thought I was getting a puppy,” she giggled. To my right was a producer from “The Amazing Race” along with his wife and some of their family members now living in Paris. They kept to themselves, probably fearful of a crowd of inebriated diners pleading for a spot on the show — I have no idea where he would get that idea. 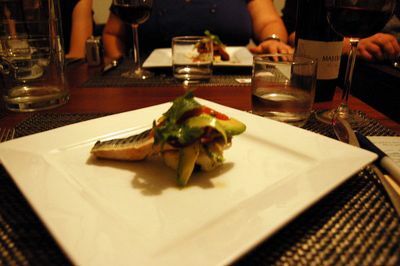 Though I didn’t love the fish courses and would have preferred a table more mixed than ten other Americans, the night — and the rest of the meal — was otherwise brilliant. Even more than the allure of the illicit, dining in a Parisian apartment allowed me, at least for one evening, to indulge in a fantasy: a fantasy that this was my life, wining and dining in an intimate dining-room in my favorite city in the world. Sometime after midnight, happily full and wine-muddled, we nibbled our petit-fours, sipped the last of our coffee, paid the “suggested contribution” of 70 euros, exchanged e-mail addresses with our new friends and set off for a nightcap at a neighborhood spot recommended to us by Braden and Laura. It wasn’t quite time to call it quits on our underground adventure in the Parisian food world.